This photo was taken on February 6, 2016 at 1:32 PM. The location was a few blocks from my house, on the same street, in Bethesda, Maryland. The "Take It!" came from my having a great interest and attraction to the Poplar Tree. The main attraction is the dark heart in the center of the trunk and branches. I know not what or how this comes about, but the contrast in color is striking. I connect to the heart being deeper in the tree and surrounded ( almost like it is being protected ) by surrounding wood that announces its function by this color differentiation. As one can readily see, there is rarely perfect symmetry, which is one of the mysteries of nature, but brings us beauty in many profound demonstrations. The After Take: has me seriously contemplating, featuring this specific cut log, at this end, in this position for a time lapsed series, to capture the progress of the already started checking process. These, now tiny splits, will grow in size, as the moisture stored in the limb will evaporate/escape into the atmosphere, thus changing the composition of the fiber bonding of the wood. The splits will widen and grow longer as it dries. I have been told by several wood workers that it takes about a year per inch of thickness for cut wood to dry before it is really ready to be worked for finished pieces, such as furniture. To assure the proper low moisture content, much of wood used for building or furniture is carefully kiln dried. I look forward to adding to this starter photo, the follow up, progressions as time and the weather has its way with the wood. I hope you have some freshly cut wood near you, so that you too, can conduct your own, watch it happen, enjoyment. Hey Taylor I know you'll appreciate this buddy. 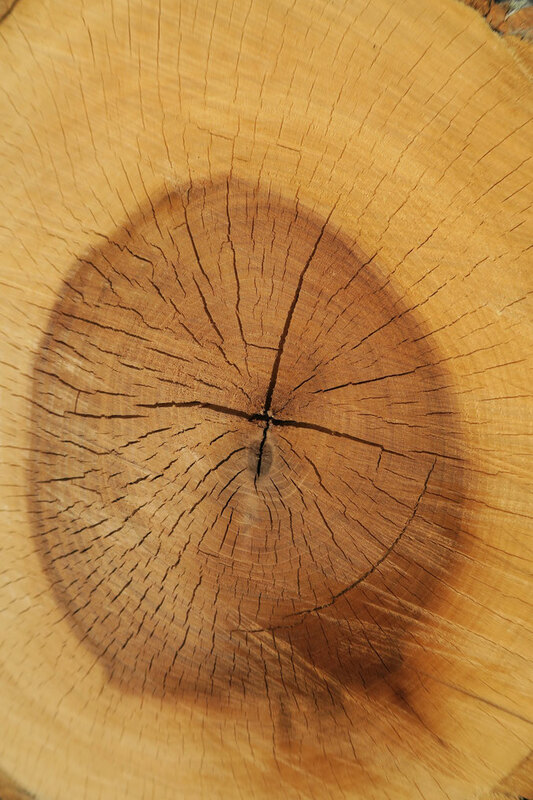 Doesn't the crack in the center of the wood look like a B-Wing from Star Wars? 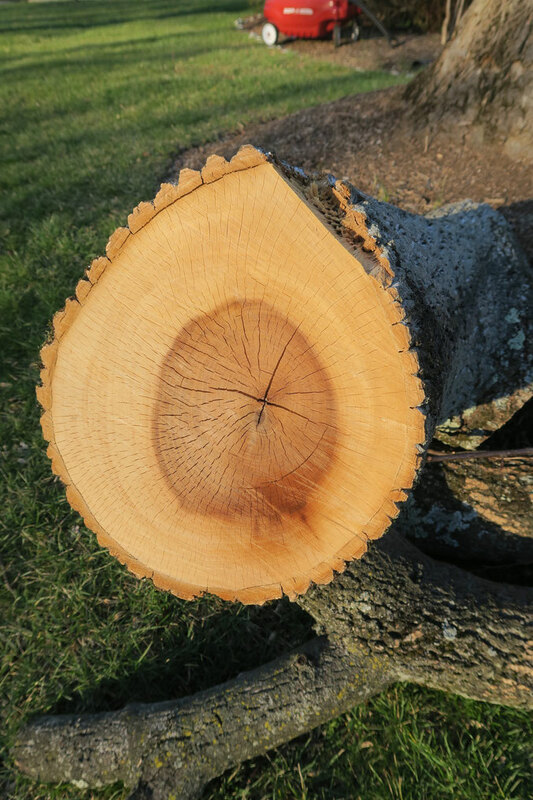 Our youngest just learned that you can determine a trees age by counting the rings. She's dying to sit down now and count them, its so cute. I seem to remember from my old woodshop days that the dark center to the trees is a result of the majority of the moisture passing through the tree, which stains the wood. I could be way off but I think thats what they told us. Although its been 15 years. The time lapse sounds awesome!! You should do it! The thing I am curious about is why that dark part shoots out of the heart on the lower right side, the dark spike looking area. I wonder how and why that happens. I'll ask the earth science department at our school next time I see one of them. Maybe I can help solve the mystery.